Social media has become an increasingly viable source for art lovers. Artists are taking to the platform in swathes to exhibit their work and share their artistic process with the world. Instagram in particular is an increasingly popular platform by which talented individuals can share their art and connect with a global online community. The exposure gained on Instagram can be paramount to the growth and success of unknown artists, and hyperrealist art tends to be one of the styles that captures the attention of social media most easily - as it has done across the web. Scarily accurate portraits of celebrities frequently go viral as the online community attempts to decipher the secrets behind paintings so good they’re easily mistaken for photographs. Jack Ede is a young UK based hyperrealist artist obsessed with creating stunning celebrity portraits. After spending an incredible 137 hours on a detailed drawing of Morgan Freeman, it seems apt that his Instagram simply states “I draw a lot”. The 19 year old gained prominence on the photo-sharing social network after his portrait of One Direction's Harry Styles went viral, prompting him to quit school and pursue a career in art full time. Since then the UK based artist has gone from strength to strength. His impressive portrait of movie legend Robert De Niro also caught the attention of Zac Efron in February, who shared the piece on his twitter, boosting Jack’s following and further demonstrating the true power of social media. The talented artist continues to draw stunning portraits and currently has a following on Instagram of over 110,000, and growing! Not restricted by pencil and paper, Jack also works as an apprentice for London’s Iron and Ink tattoo parlour. Demonstrating that the talent of this young hyperrealist knows no bounds and solidifying his status as one of the best artists under 20 in the UK. At first glance, the incredibly detailed paintings of Marco Grassi appear to be photographs. With softly creased lips, barely visible flyaway hairs, and skin adorned with blemishes and a velvety fuzz, it’s easy to see why some people get confused when admiring the Italian’s artwork. Grassi calls his style ‘surreal hyperrealistic’, and often uses the human bodies he so meticulously paints to add surreal additions. For example - intricate patterns cut out of their body to reveal a hollow back, or vibrant greenery growing over their skin. By combining these inhuman elements in breathtakingly lifelike portraits, his subjects lose their personhood and are utilised as decorative objects, leading us to question our self-deception and objectification of the human body. Via his instagram Grassi shares not only his portraits, but photographs of his work in progress, his technique, and closeups that allow you to appreciate the stunning detail. Not only this but he also occasionally shares personal posts and pictures, allowing him to connect with his following on social media more intimately. Marissa Oosterlee has over 11,000 followers on Instagram and has been a professional artist since 2003. After perfecting an airbrushing technique that allows her to create incredible hyperrealist works of art, she now teaches classes to those hoping to hone their skills in realist art. The dutch artist and illustrator is not restricted to creating stunning portraits. She also brings life to wildlife, illustrates fantasy worlds, and explores classic realism through her work. Marissa has acquired worldwide attention for her photorealistic pieces of art, and won a national Dutch painting competition in 2004 with her portrait of the Queen of Holland. She currently lives and works in The Netherlands and runs her own gallery and studio, in which she offers workshops with fellow artist Carlo Tedesco. German artist Mike Dargas gained prominence after completing a collection of hyperrealistic works of women’s faces dripping in honey. 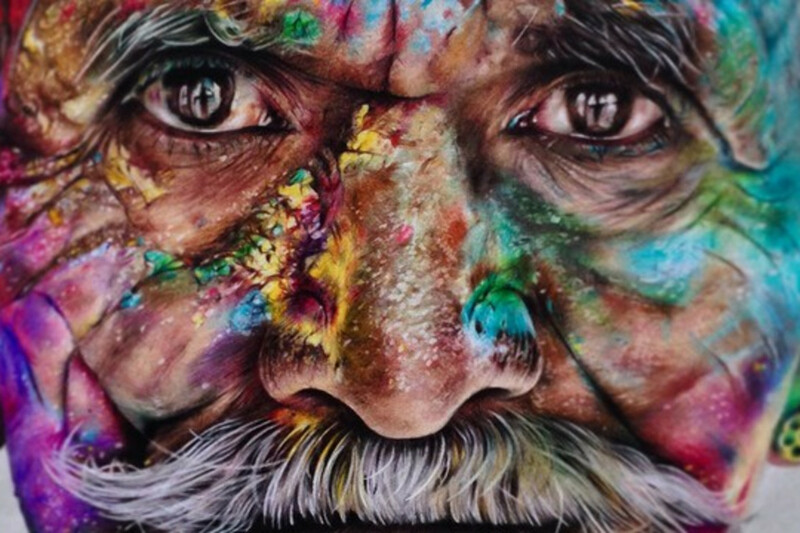 He shares the images with his following of over 112,000 on Instagram, impressing them with the painstaking detail in each face and the viscous shine of the thick substance cascading down their faces. The artists, who lives and works in Cologne, is inspired by Dali and Caravaggio and likes to explore both surrealism and realism. His paintings are oil on canvas, and his precise technique results in realistic portraits that could easily be mistaken for photographs. He also uses his Instagram to share photos of his paintings being completed, giving his followers an insight into his artistic process and stressing their realism by presenting them alongside real life people and objects. His art challenges the viewer to develop their own understanding of the nature of the human being and leads them to question their own emotional perception. Maria Teicher is a painter and photographer with a impressive 23,500 followers on Instagram and counting. She describes herself as a “Whiskey drinker. Black-Cat Mom. Studio recluse, Proud Philadelphia, PA dweller” and loves to share her talent with her social media following. Teicher is a fine artist with a focus on detailed portraiture and often incorporates layers and imagery to drape over her subjects, for instance braids, a fine material, or seemingly suffocating plastic. These additions give her pieces remarkable depth, a compelling narrative, and stunning symbolism. And that's all I'll reveal until my show gets closer in October! Saving the finale as my little secret.